In this video we will discuss the power and use of Over clause in SQL Server. The OVER clause combined with PARTITION BY is used to break up data into partitions. The specified function operates for each partition. 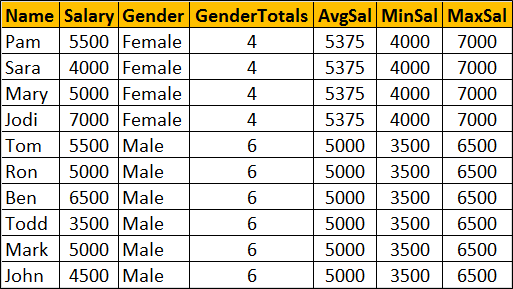 COUNT(Gender) OVER (PARTITION BY Gender) will partition the data by GENDER i.e there will 2 partitions (Male and Female) and then the COUNT() function is applied over each partition. Any of the following functions can be used. Please note this is not the complete list. COUNT(), AVG(), SUM(), MIN(), MAX(), ROW_NUMBER(), RANK(), DENSE_RANK() etc. Example : We will use the following Employees table for the examples in this video. 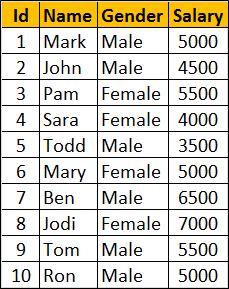 Write a query to retrieve total count of employees by Gender. Also in the result we want Average, Minimum and Maximum salary by Gender. The result of the query should be as shown below. This can be very easily achieved using a simple GROUP BY query as show below. You cannot include non-aggregated columns in the GROUP BY query. One way to achieve this is by including the aggregations in a subquery and then JOINING it with the main query as shown in the example below. Look at the amount of T-SQL code we have to write.